By bringing your devices to Azure AD, you maximize your users' productivity through single sign-on (SSO) across your cloud and on-premises resources. At the same time, you can secure access to your cloud and on-premises resources with conditional access. 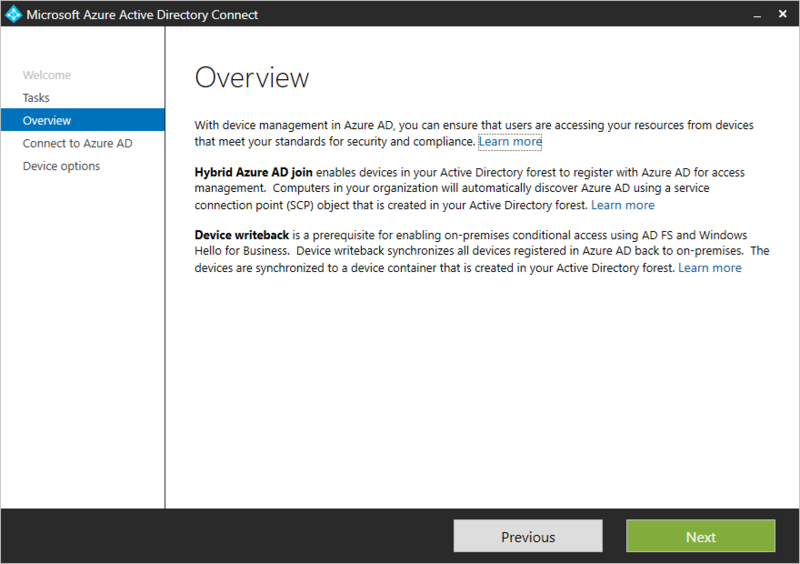 In this tutorial, you learn how to configure hybrid Azure AD join for devices in managed domains. The latest version of Azure AD Connect (1.1.819.0 or higher) to be installed. Verify that Azure AD Connect has synchronized the computer objects of the devices you want to be hybrid Azure AD joined to Azure AD. If the computer objects belong to specific organizational units (OU), then these OUs need to be configured for synchronization in Azure AD connect as well. 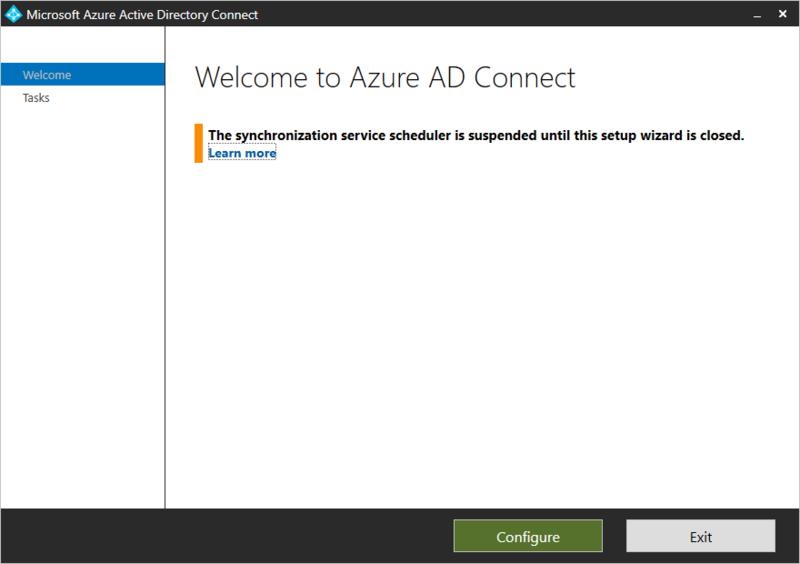 Beginning with version 1.1.819.0, Azure AD Connect provides you with a wizard to configure hybrid Azure AD join. The wizard enables you to significantly simplify the configuration process. The related wizard configures the service connection points (SCP) for device registration. The configuration steps in this article are based on this wizard. If your organization requires access to the Internet via an outbound proxy, starting with Windows 10 1709, you can configure proxy settings on your computer using a group policy object (GPO). If your computer is running anything older than Windows 10 1709, you must implement Web Proxy Auto-Discovery (WPAD) to enable Windows 10 computers to do device registration with Azure AD. If your organization requires access to the Internet via an authenticated outbound proxy, you must make sure that your Windows 10 computers can successfully authenticate to the outbound proxy. Because Windows 10 computers run device registration using machine context, it is necessary to configure outbound proxy authentication using machine context. Follow up with your outbound proxy provider on the configuration requirements. The credentials of a global administrator for your Azure AD tenant. The enterprise administrator credentials for each of the forests. 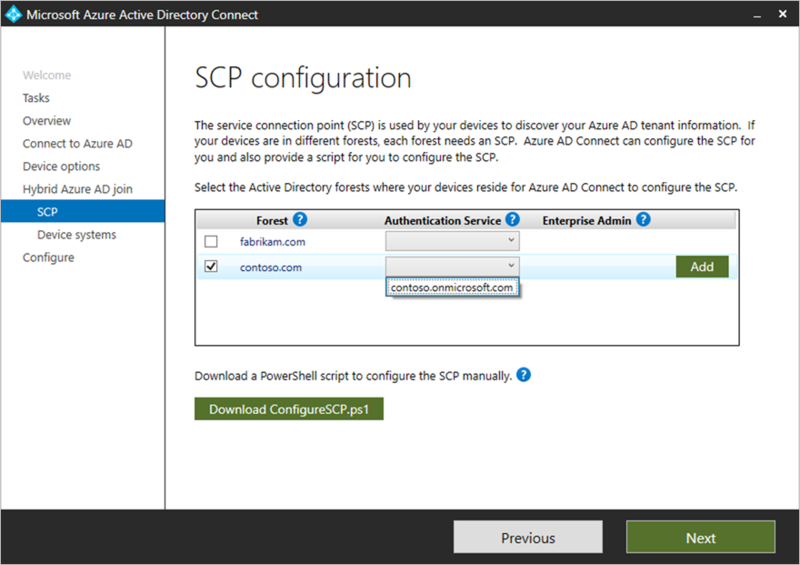 Launch Azure AD Connect, and then click Configure. 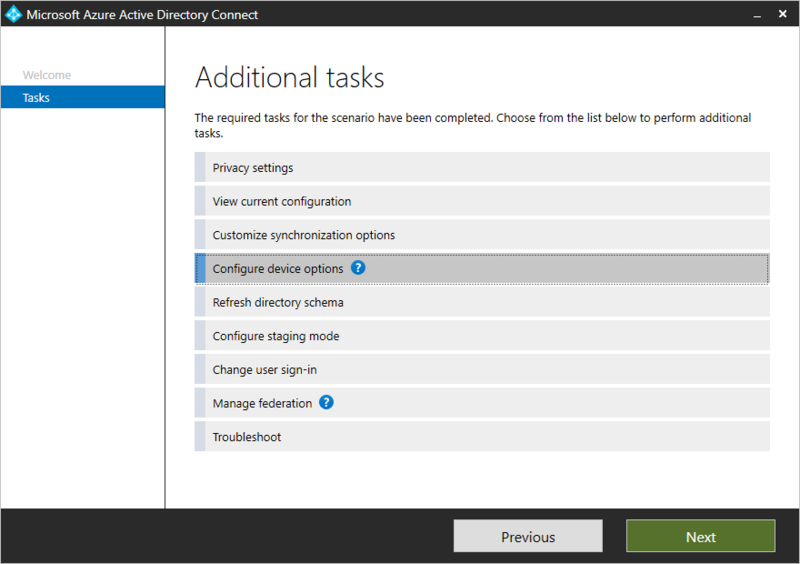 On the Additional tasks page, select Configure device options, and then click Next. On the Overview page, click Next. 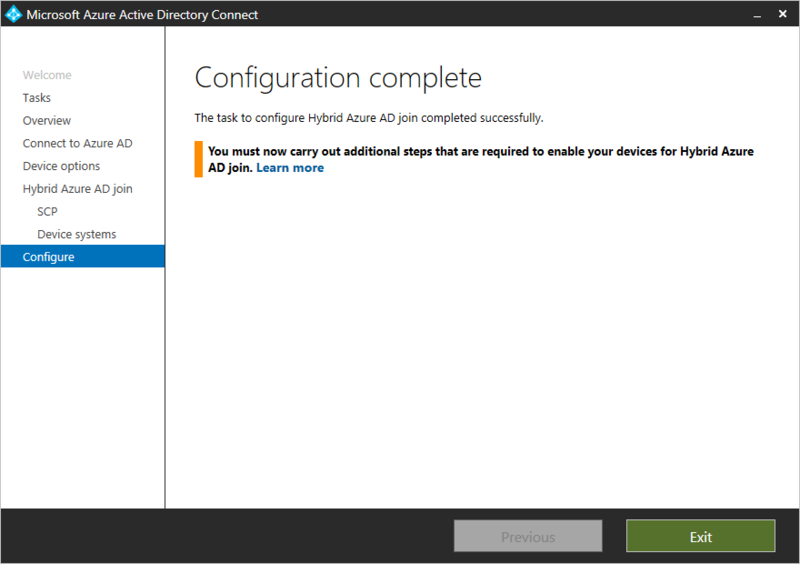 On the Device options page, select Configure Hybrid Azure AD join, and then click Next. b. Select the authentication service. c. Click Add to enter the enterprise administrator credentials. 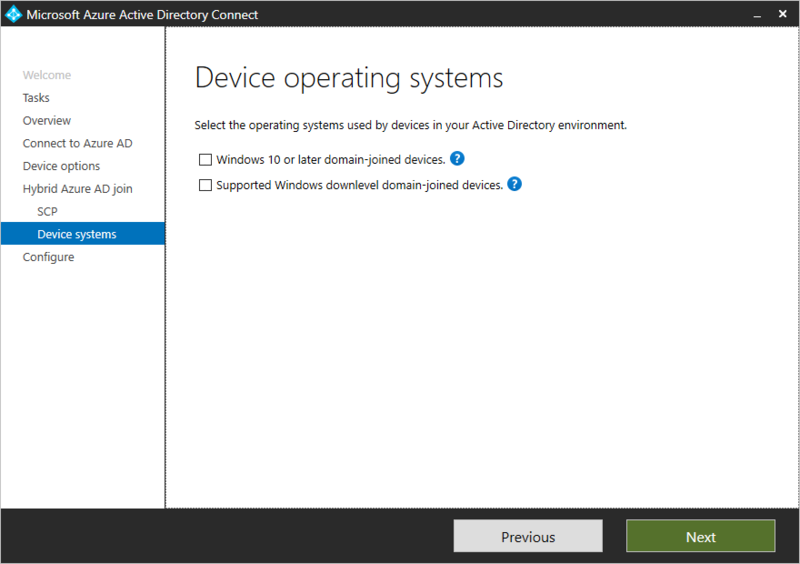 On the Device operating systems page, select the operating systems used by devices in your Active Directory environment, and then click Next. On the Ready to configure page, click Configure. Additionally, you need to enable Allow updates to status bar via script in the user’s local intranet zone. 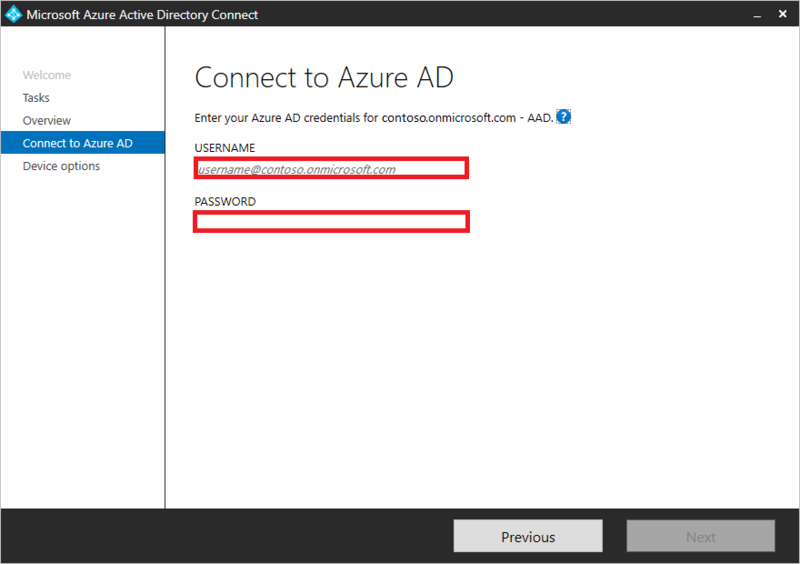 To successfully complete hybrid Azure AD join of your Windows down-level devices in a managed domain that is using Pass-through Authentication (PTA) or Password Hash Sync (PHS) as your Azure AD cloud authentication method, you must also configure Seamless SSO. To register Windows down-level devices, you need to download and install a Windows Installer package (.msi) from the Download Center. For more information, click here. To verify the device registration state in your Azure tenant, you can use the Get-MsolDevice cmdlet in the Azure Active Directory PowerShell module. An object with the device id that matches the ID on the Windows client must exist. The value for DeviceTrustType must be Domain Joined. This is equivalent to the Hybrid Azure AD joined state on the Devices page in the Azure AD portal. 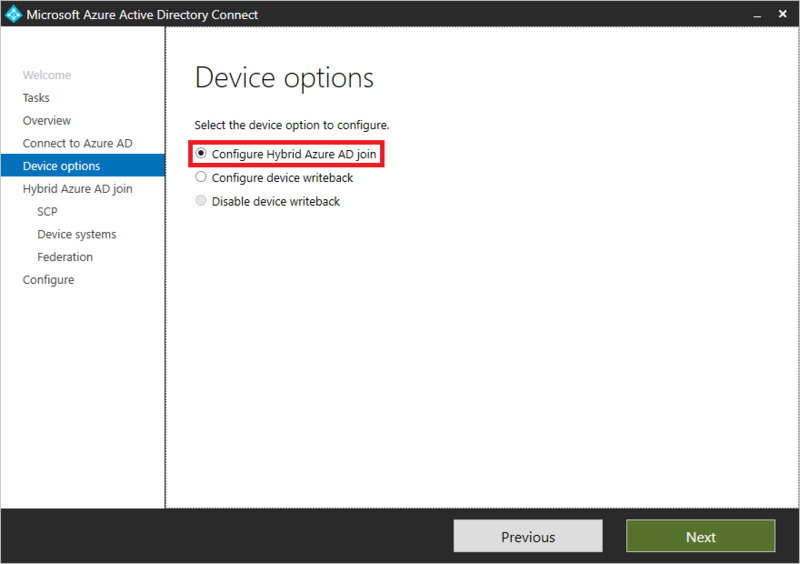 The value for Enabled must be True and DeviceTrustLevel must be Managed for devices that are used in conditional access. Type Connect-MsolService to connect to your Azure tenant. Verify that Enabled is set to True.